MCALLEN, Texas, April 4, 2017 /PRNewswire-USNewswire/ -- Local veterans enjoyed a special night of bonding at a recent Wounded Warrior Project® (WWP) Peer Support Group meeting. 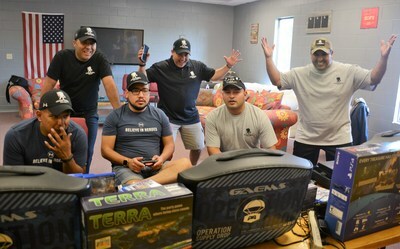 The event was an opportunity to raise esprit de corps among McAllen wounded warriors through video gaming. Video gaming is used as a means of therapy and increasing morale for warriors on deployment and those who return home with injuries. It becomes more impactful for injured veterans with little to do in small towns who are wanting to connect with one another, their friends, and families in a safe environment. "Our chief medical officer ensures we are pairing the right video game care package with each warrior to help with their journey to recovery," said Ray Whitaker, chief operating officer of Operation Supply Drop, which donated video game care packages to the group. "It is our pleasure to provide another tool to the Peer Support Group when helping rehabilitate our brothers and sisters." The overall goal of the evening was to have Peer Support Group members relax and enjoy themselves in a comfortable space that accommodates physical injuries and social anxieties. Warriors gathered around multiple TV and video game console setups shouting encouragement and competitive jabs while challenging one another on a series of popular games. The warriors were grateful for the opportunity. "I really want to thank Operation Supply Drop and Wounded Warrior Project for making this happen," said Earl Lane, U.S. Marine Corps veteran and Weslaco, Texas, resident. "I hadn't played PS4™ games in a while, and I had forgotten how much fun it is. It took me back to good memories about my deployments and overshadowed some of the bad ones. Now that I think about it, with all the bad things that happened during the deployment, I had forgotten about the good times. This night reminded me of those times, and for that I am grateful." To learn more about how WWP's programs and services are making an impact on the lives of wounded warriors, visit http://newsroom.woundedwarriorproject.org/. To find photos from warrior-to-warrior Peer Support Groups across the nation, click on multimedia, images, then warrior connection and outreach.